Paired often with slow-cooked barbecue, grilled chicken or pork, coleslaw is one of the most popular side dishes around. But, where was this American favorite created? And, how did it become the side dish that it is today? As the experts on barbecue and its popular sides, we’re here to tell you the story of how this dish came to be. Read below to discover the unique history of coleslaw. 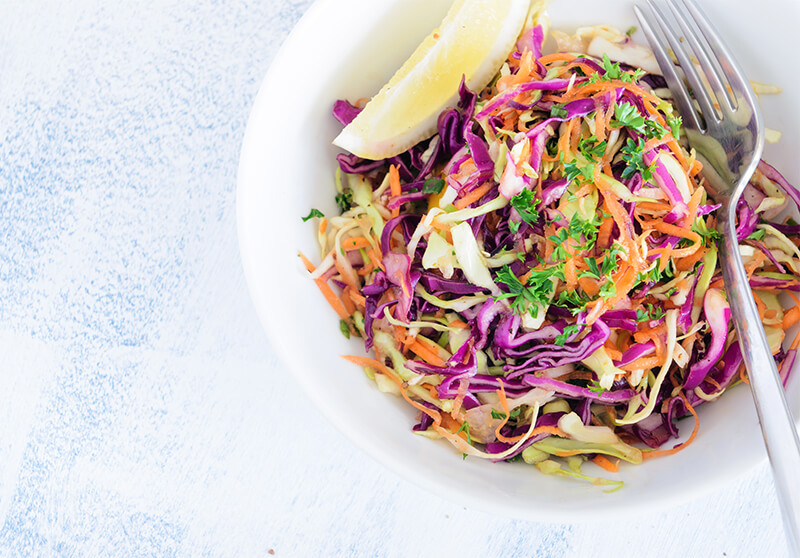 Like much of American cuisine, the coleslaw we enjoy today is inspired by recipes and dishes from all over the world. The roots of coleslaw recipes make their way back to ancient Rome. Roman citizens would often eat a meal featuring cabbage, eggs, vinegar, and other spices. On the other side of the globe, the Dutch founders of New York served a shredded cabbage salad similar to today’s ‘slaw. The dish was initially created in the Netherlands, but traveling to a new country didn’t stop them from making it. In fact, the term coleslaw originates from the Dutch expression koosla, which means “cabbage salad.” Recipes similar to coleslaw have been found and used in American homes from as early as 1770. However, one of the most pivotal moments in the history of coleslaw was the creation of mayonnaise in the 18th century. Although the main ingredients of coleslaw—shredded cabbage and dressing—are still mostly there, coleslaws across America have integrated new flavors and varieties. Inspired by ingredients from around the world, coleslaws today may include curry, jicama, sweet onion, sesame oil, bok choy, and even granny smith apples. Some even argue that coleslaw can be made without cabbage. Other shredded vegetables have been known to take the place of shredded cabbage. These recipes call for root vegetables, fennel, beets or carrots instead. However, these variations are not common, and most recipes you find online today still include some type of cabbage. Although many international coleslaws are made without mayonnaise, the signature American recipe would not be complete without it. Especially when served with barbecue, mayonnaise-based dressings are a worthy complement to the smoky tang of BBQ’d meats. It’s no wonder coleslaw has turned into a traditional side dish for barbecue. The chefs at Chad’s BBQ have created a recipe so good, it’s sure to make the history books. So, the next time you’re in Edgewater, be sure to stop by for a quick bite to eat. Since 2013, we have been committed to fusing local recipes with international flavors. For more information on all things Chad’s, be sure to subscribe to our email list.